Last week’s narrowly written North Carolina Supreme Court decision about NC PreK didn’t really break any new ground. It mostly reinforced the status quo, affirming again that all children in the state have a constitutional right to a sound, basic education that includes access to pre-k programs for at-risk kids. It also vacated a lower court decision that found new specific barriers to pre-kindergarten access unconstitutional because the General Assembly removed the new barriers that it had earlier imposed. Berger went on to claim that the vast majority of at-risk kids are currently being served by the budget that lawmakers passed this year. That will come as news to the parents of the 40,000 or so at-risk four year olds who cannot enroll in the program because Berger and his colleagues didn’t see fit to provide enough funding. The budget the General Assembly passed and Governor McCrory signed in July provides 27,500 slots in NC PreK. That’s down from the almost 35,000 slots funded five years ago and down 2,500 slots from last year when former Governor Beverly Perdue used temporary funding to open up places for 5,000 more kids. No General Assembly has come close to providing enough funding for the roughly 67,000 at-risk four year olds who qualify for the program every year. Berger and his Republican colleagues want to solve that problem by redefining at-risk, which does nothing but leave thousands of children struggling, locked out of a program that evidence shows helps them do better academically. That was also lost in most of the coverage of the court decision, the compelling evidence that children who participate in NC PreK and other early childhood programs do better in school than at-risk children who are denied the opportunity for extra help. Research also shows those kids do better in life too. Critics of the program like to cite studies that show some of the academic gains made in the first few years of schools fade away as the students move on to higher grades. The fade away isn’t shocking, given that poverty and other risk factors don’t disappear as children reach middle school. What’s surprising is that the critics of the program use the fade away to blast programs that work instead of finding ways to continue to provide meaningful supports for the student and their families. Isn’t helping the kids the point after all? And finally, what does it say about the political leadership of the state that it may take a court to force them to fully fund a program that helps at-risk kids learn and improves their chances of having successful lives? Berger ought to stop patting himself on the back and start helping kids. A couple of the news accounts of the court decision noted that it would take about $300 million a year to create enough slots for all the at-risk four-year-olds currently eligible for NC Pre-K to enroll—about twice the current level of funding for the program. The tax cut for wealthy individuals and out of state corporations passed by Berger and his fellow legislators this summer will cost the state $438 million next year, $650 million a year when fully implemented. That is more than four times the additional cost of fully funding NC PreK so all at-risk kids can enroll. 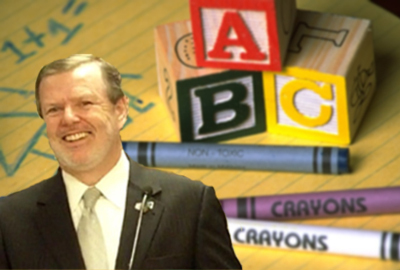 Berger clearly has his priorities and judging by his reaction to the court’s ruling and his decisions this legislative session, at-risk children in North Carolina do not appear to be among them.